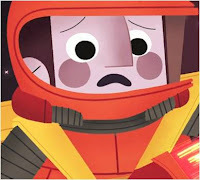 When animator Andrew Ruttan caught sight of Andrew Kolb’s illustrated interpretation of David Bowie’s classic song Space Oddity he immediately knew what he wanted to do. He emailed Kolb and asked if he could animate his illustrations. Here is the result, so there is no need to tell you that the answer was in the affirmative. I had immense fun wallowing in nostalgia and enjoying this not for profit animated short. This is such a very cool 'collaboration' of three artists (two Andrews and a David!) working in three different spheres but bringing forth a complete whole. Of course, Mr Bowie may not be aware of this latest take on his timeless song but I would like to think that he would approve. It is still (happily) available on itunes to download so perhaps a whole new generation can now discover the mystique and marvel of Major Tom.